I discovered an oasis of calm, mere footsteps from Buckingham Palace - a very welcome respite from the chaotic, buzzing metropolis of London. 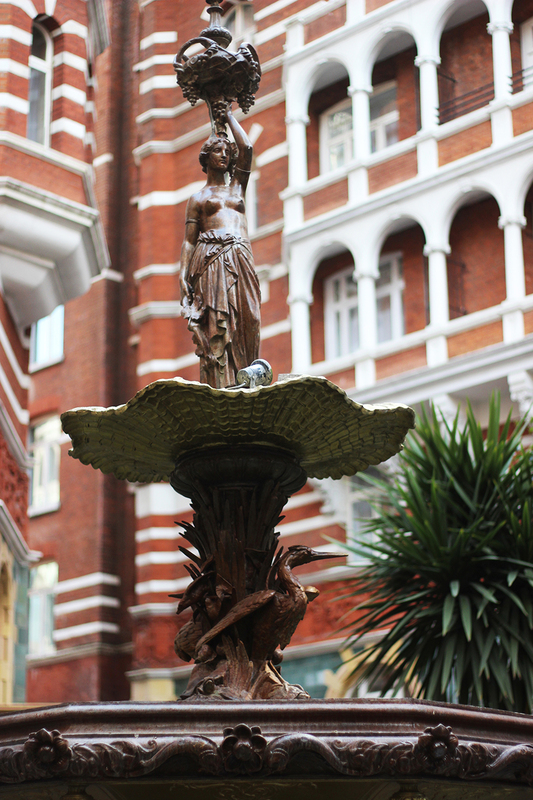 In the heart of what is surely London's grandest address (hello, Queenie!) are eight Victorian townhouses from Buckingham Gate to St. James' Court. These rows of redbricks, the most stunning of their kind, form St James' Court, A Taj Hotel, a luxurious spot of tranquility patronised by the rich and sophisticated who want to destress like an empress. Literally - some of the townhouses have an annex to Buckingham Palace, convenient for a surplus of royal guests. Very fitting that I should dine like a queen at St James' Court's four restaurants, as a sneak preview of their 80 Tastes pop-up before it opens to the public. The first flight of my gastronomical tour around the world began in serene St. James' Courtyard, a celebrated Shakespearean courtyard open in Summer and is surely one of London's most stunning spots for al-fresco dining. I couldn't think of a better setting for a Zomato Meetup - London's favourite foodie app always organise the most lovely evenings for its' community (see here and here) but this time, Zomato really outdid themselves. 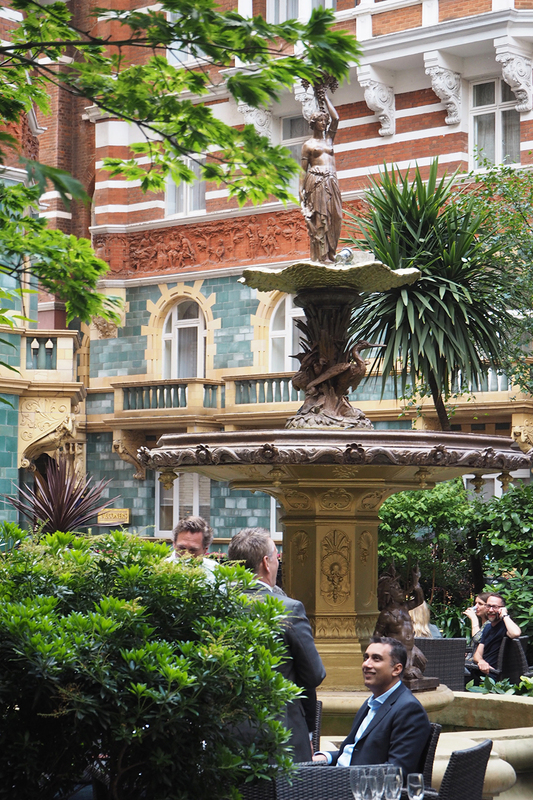 Here in the courtyard, the old and the new mingle - Victorian turrets and cornices with sleek, modern glass walls; suited businessmen on power lunches with ladies who live for afternoon tea. All under the watchful eye of the fountain's cherubs and the stone ladies who hold up the 16th century stonework. I whetted my palate with a Laurent Perrier Champagne flight (although three flutes is a little over my personal limit of two glasses before the onset of Asian red-face) paired with canapés - ratatouille on toast, smoked salmon and cream (which went down a treat with the rosé), and a gorgeously fresh scallop and avocado ceviche. I moved on to Bistro, the hotel's contemporary European restaurant, for the second stop of my gastronomical Phileas Fogg-esque journey. Here, Executive Chef David Tilly's fastidious sourcing of ingredients and local produce came across in the freshness of the sesame crusted tuna (perfectly seared on the outside, joyously pink on the inside) with pink grapefruit salad and wasabi potato. This grapefuit-hater was pleasantly surprised to report that the usually-bland fruit was well-balanced to the fieriness of the wasabi. For my third course, my party decamped to Quilon, the hotel's Michelin-starred South West Indian restaurant. In the moody, ambient private dining room downstairs I sampled the flavours of Kerala against the subtler spices of the South, said to be the spice bowl of India. I enjoyed the seafood spread (with a touch of Sri Lankan influence) of the Fisherman's Catch - pepper shrimp, crab cake, lentil fish, and grilled scallop. I wiped up the Quilon fish curry - cubes of halibut simmered in coconut, chilli, and raw mango sauce - with malabar pratha bread, marvelling at the lightness of the dishes. Chef Sriram Aylur (who imports more fresh Indian spices than any other Indian restaurant in Britain) explained that his food was prepared braised, boiled, and stewed and so had very little fat, joking that I would walk out healthier than when I walked in. Indeed, the food was satisfying flavourful and hearty with none of the 'oooofff' feeling I get after a typical Indian meal. So much so that I didn't even need the St James' Court bespoke tuk-tuk to ferry me - I was walking on air all the way! The last leg of my journey around the world in 80 noms was Kona, the hotel's modern European restaurant. While Chef Thomas Cruise's cuisine is inspired by the Riviera, the ingredients were resolutely British, most of it predominantly sustainable produce sourced from within 120 miles of London. For my final course of the evening, I supped on Norfolk 'roam free' chicken crusted in parmesan and red poblano, with a sweet roasted garlic reduction served with a light tuscan panzanella salad. Pudding was three chocolate tasters; manjari parfait with malleable chocolate ganache served with chocolate sorbet and the most delightful Seville orange gel which deserved to be a pudding on its own. It certainly was an evening of journeys. More than just a culinary road trip, I enjoyed walking down the annals of history, learning about the townhouses before they were formed into St James' Court and Taj Hotel (the townhouses belonged to aristocratic philanthropists who bequeathed the building to various charities and causes, before it became the palace of pleasure it is today). I myself am astonished to have missed this hidden gem of a hotel, as centrally positioned as it is amongst the royal residences and with is proximity to what is possibly London's most visited residence, Buckingham Palace. Who knew that just footsteps from what is arguably this busy city's biggest tourist attraction is such a souk of serenity, quiet, and calm? I'm thinking that St James' Court will do nicely as a staycation destination (I've already loaded up a Netflix playlist and packed my overnight bag!) for a weekend of playing tourist in the city. Follow my footsteps and book a gastronomical journey Around The World in 80 Tastes at St James' Court Hotel. Find them at 54 Buckingham Gate, London SW1E - if you get lost, just ask one of the Queen's guards for directions (I kid). Wow, this culinary road trip sounds very interesting. I always love the feeling of enjoying good food and learning the history. What a brilliant idea that they had you guys visit all of their restaurants. I really enjoyed the champagne flight and meal when I visited Bistro 51. Definitely need to return and sample the other delights! You've captured everything so beautifully! Such a beautiful hotel, hard to believe that courtyard exists in the middle of London! The curry course was my absolute favourite, so flavourful and so nice to hear that it's healthy!